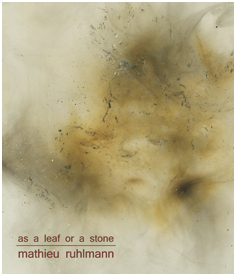 On "As a Leaf or a Stone" Mathieu Ruhlmann shows us how hard it is to put a label on art. The six tracks are a perfect example of soundart in its purest form. They linger somewhere between "just" compositions made from field recordings (which they are), musique concrete, Fluxus or maybe even ambient. Each sound is being lifted from perspective as device towards a musical instrument, creating great atmospheric stories. All tracks come with a summation of the devices or attributes with which the sounds are made. So don't look strange when you read bubble wrap - and you won't hear it as such - or turkey baster - which can't be found in my kitchen - insects or pond weed. If it's got a sound, Mathieu will use it. At the same time it is hard to write more about the album then a somewhat distant description of the 'how'. It's music for people who know how to listen to it I suppose. Very intensive, very mind tingling and definitely very interesting. Ambient music is defined to form a whole with the surrounding sounds (by the definition of Brian Eno), This album is an example of mainly those surrounding sounds and that is what makes it so intensive to listen to. It wouldn't surprise me to see Mathieu Ruhlmann going towards the Touch label in the future. And a combined tour between him and Hazard would be a logical next step.